Since I started working at home, I’ve been all about comfort and ease around the house and running errands. Jeans, soft tees, and jackets you can throw over anything. 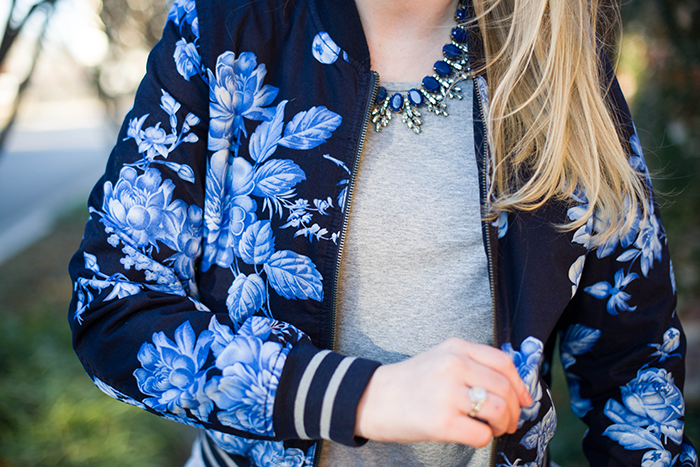 I bought this fun floral-printed jacket on a whim at GAP because of my love of blue hues. It is one of the most comfortable things I own right now and it’s pretty thick too, making it a great layering piece for this frigid weather. Did I mention it comes in two other solid colors and it’s under $100? Now that’s what I call a style steal. I can’t wait to throw it over my white LBD’s and t-shirt dresses this spring for a laid-back look. Would be super cute with a pair of white Chuck Taylor’s, don’t you think? Check back tomorrow for the best sales of the weekend – have a great one! Cute jacket, I actually love the floral one better than the others, great casual outfit. Love the jacket! The Gap has great stuff! Casual chic at it’s best. I love your cute floral jacket!! That Gap jacket is super cute. Love the necklace with it. I spent way too much time in Gap the other day debating whether or not to buy this jacket. You just sold me! It’s so reminiscent of last year’s Rag and Bone version…but far more affordable! I almost purchased this jacket last weekend! I couldn’t figure out if I would get any use out of it, but after this post, I’ll probably go back and get it! 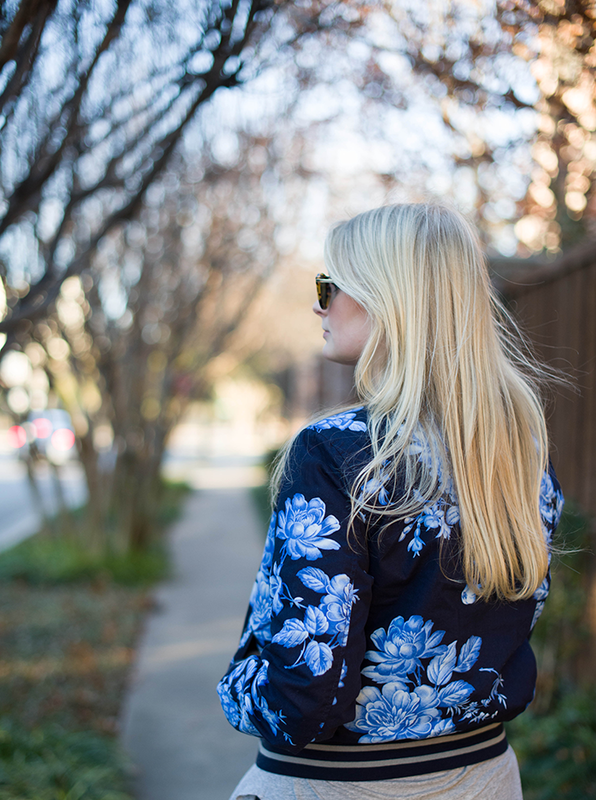 This jacket has been on my wish list since it first came out – love how you styled it here! That jacket is adorable but I am freaking out over those shoes – love that cut! Love that jacket! A less expensive version to the Rag & Bone from last spring. Have a great weekend! This looks is the bomb. Pun intended. You look fabulous! 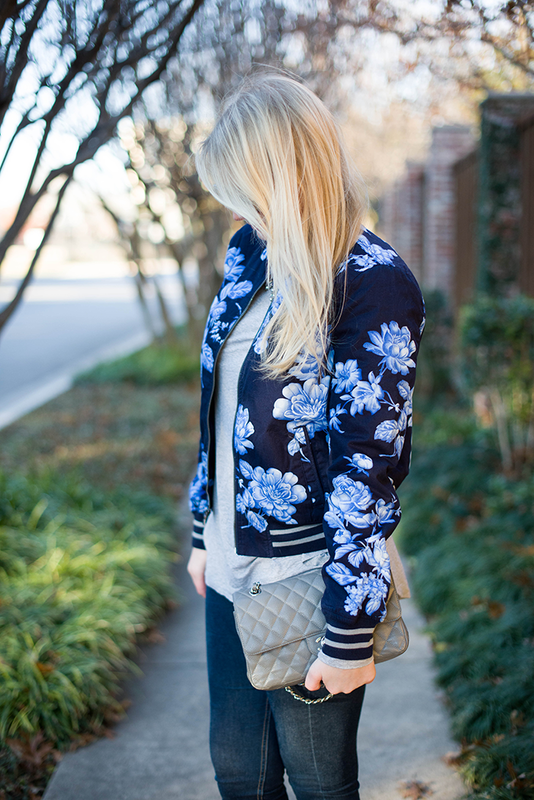 I’ve been looking for a classic bomber jacket and I love yours! The floral adds the perfect girly touch. You styled that jacket so perfectly! Love everything about this look! I love this!!! So effortlessly chic! Ahhh, great minds think alike! Mara from mlovesmblog.com is rocking that gorgeous coat today too! I literally just got an email from Gap about this jacket! I am obsessed, to say the least! Love the way you styled it, and the fact that it sounds really warm! Wow I love that jacket! It’s so cute and the colors are amazing. Have a great weekend, and if you get a chance, I’d love for you to come by and enter my giveaway! Love your floral print jacket. What a great addition to your look. Love the jacket and the necklace! Beautiful look! And for a minute I thought this post would be about my favorite perfume;) Love the print and the jewels! What an adorable jacket!! I love it! It would work with so many things. Have a great weekend! I’m dying over this bomber. I’ve been looking for a great one everywhere. I just might get this one ! I saw this jacket in Gap last week and was skeptical, but I LOVE the way you’ve styled it! You’ve got me ready for spring already! 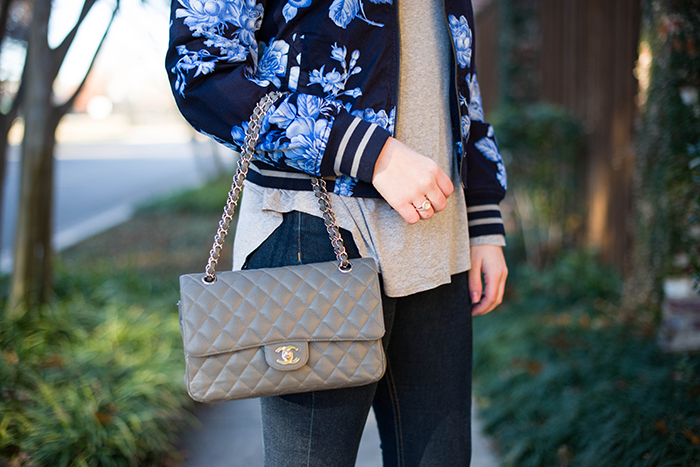 Love the floral bomber! Love the jacket…headed over to check it out further.